Written by Jin Won Choi on Nov. 17, 2017 in Jin's TFSA Updates. In this series, I (Jin Choi) talk about my goal of reaching $1 million in my TFSA account by 2033. If you want to know what a TFSA is, I recommend you read my free book. In this article, I’ll also explain why I now believe oil prices will settle at or above $60/barrel in the long term. At the end of October, I had $47,327 in my TFSA account, which was down by 3.6% since the start of the month. By comparison, the Canadian stock market went up by 2.7% while the U.S. stock market went up by 5.8% in Canadian dollar terms. Therefore, my portfolio underperformed in October. The majority of my portfolio still consists of oil and gas stocks. 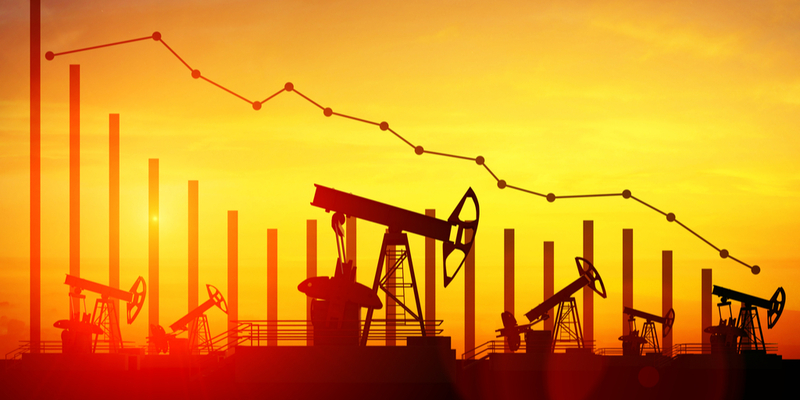 In October, oil prices climbed from $51.67/bbl to $54.36/bbl. But despite oil’s rise, the majority of my oil and gas stocks went down in value during the month. There have been several such months this year where oil stocks went down even as oil itself went up. I believe the stock market is being irrational. For example, Baytex (Ticker: BTE), which is one of my largest holdings, is priced at $4.27/share as of the time of this writing. This is the same price that Baytex used to fetch back in March 2016, when oil was trading below $40/barrel. While it’s annoying to see my oil and gas stocks languish, I will remain patient. To me, it’s more important that the companies generate healthy profits than to see their stock prices rise. If the profits keep coming, the stock price will eventually reflect that reality. Of course, oil and gas companies’ profitability will depend in large part on oil prices. To remain profitable, the companies I hold need oil prices to remain above $55/barrel at minimum over the long term. But will it? That’s the overarching question. Several months ago, I “threw in the towel” on my bet that oil prices would rise above $60/bbl for the long term. But since then, several of the assumptions that led me to that conclusion have proven incorrect. I’m therefore revising my belief once more, and I now believe that oil will settle at $60/barrel or higher over the long term. To understand my latest about-face, let’s first revisit the reason I thought oil prices would stay below $60/barrel. It all comes down to a simple calculation regarding shale oil. Assuming 800 rigs will drill for oil in the U.S., and assuming each rig will drill 20 wells a year, U.S. producers in aggregate should drill 800 x 20 = 16,000 wells a year. Then, assuming the average well produces 200 barrels/day in its first year, the U.S. should bring 16,000 x 200 = 3.2 million barrels/day to the market in a year. Assuming a production decline of 2 million barrels/day from older wells, total U.S. production should rise by 3.2 - 2 = 1.2 million barrels/day each year. 1.2 million barrels/day is almost enough to satisfy the annual rise in global oil demand, as long as production from the rest of the world remains steady. In conclusion, we can expect oil prices to remain stable at the price that induces U.S. producers to utilize 800 oil rigs. But what if oil prices go higher? Naturally, we can then expect the number of oil rigs to rise. If that number rises by just 100, then we can expect U.S. production to rise by another 100 x 20 x 200 = 400,000 barrels/day in a given year. This additional production should bring oil prices back down to the equilibrium rate. Looking at the oil market earlier this year, it seemed likely that the U.S. would reach 800 oil rigs as long as prices remained at or above $55/barrel. I therefore believed that $55/barrel would be the long term equilibrium. However, the last several months have shown that one of my assumptions is incorrect. Getting that assumption wrong in turn affected yet another of my assumptions, which when combined, have led to my whole calculation being off. The primary assumption that I got wrong was the number of barrels produced by each new well. For years, the amount of oil produced by the average shale well has gone up steadily and significantly thanks to improving technology. I assumed that further technological improvements would keep that trend going. The three major shale oil regions in the U.S. are the Bakken, Eagle Ford and the Permian. As the following chart shows, the number of barrels produced per well has increased significantly since around 2010 when shale oil drilling started to take off. While the chart shows only the information for Eagle Ford, the other basins show similar curves from 2010. Please also note that the EIA’s report estimates the first month production of each well. The average production of each well over the course of a year is far lower. This dramatic increase in per well productivity is the reason the U.S. can continue to increase total production despite a significant drop in the number of operated rigs from 2014. It’s also why oil producers could not drill profitably at $70/barrel in 2014, but can profit now with $55/barrel. However, you may also notice that in 2016, production per well suddenly started to drop for the Eagle Ford. Other regions similarly topped out in late 2016, though the effect hasn’t been as pronounced as in the Eagle Ford. Now, you may also notice that production per well seems to have edged up in the most recent months. I would not put too much faith into that data, as these numbers are estimates only, and are subject to change. For example, the drilling productivity report released in June failed to forecast any decline for Eagle Ford well productivity. The older data, however, is more trustworthy. The drop in well productivity changes the total U.S. production growth, but there’s a secondary effect as well. This drop also decreases the profit that producers can expect from drilling each well. Producers may thus drill fewer wells, and we can therefore expect fewer rigs to be active given the same oil price. Let’s see how these effects translate into numbers. If we now expect 10% fewer rigs and 10% lower production per well than I assumed previously, then the total new oil production brought online becomes 720 x 20 x 180 = roughly 2.6 million barrels/day. Assuming that older wells decline at the same rate (2 million barrels/day), we can expect the net production increase to be 2.6 - 2 = 0.6 million barrels/day. Somewhat coincidentally, that’s close to the increase of 0.4 million barrels/day forecasted by the EIA for 2017. In conclusion, I believe that $55/barrel will lead U.S. producers to utilize fewer than 800 rigs, and assuming that each new well produces 180 barrels/day for a year, U.S. production growth won’t satisfy the annual increase in demand, and oil prices will thus have to rise. However, that calculation would shift again if oil prices rose to the point that producers put more rigs to work. So what is that price point? We can’t know for sure, but we can take an educated guess. First, let’s estimate how many rigs the U.S. would need to achieve 1.2 million barrels/day of production growth. The answer is roughly 3,200,000 / (20 x 180) = 890 rigs. Now, what oil price would it take for the number of rigs to go that high? This question is difficult to answer, but I would argue that $60/barrel would be enough. At $60/barrel, almost every oil company I know of would turn a healthy profit. These companies would then plow their profits back into drilling more wells. A 20% increase in the number of drilling rigs would get us from the current number of rigs in operation to the 890 mark. I believe that oil producers would increase spending by 20% if oil stayed at $60/barrel, which in theory should translate into 20% more rigs. However, there is a big caveat with these numbers. These calculations assume that the production per well stabilizes at 180 barrels/day. But if this number deteriorates further, then we would need even higher oil prices to induce producers to put more rigs to work. Whether well productivity continues to deteriorate will depend in some part on technology, and some part on geology, with their influences pulling productivity in opposite directions. Technology should allow producers to extract more and more oil from the ground, but that ability is limited by geological constraints that get tougher and tougher to crack. For years, improvements in technology have won out over the increasingly difficult geological constraints. However, events in this past year signal that geology may be getting the upper hand. In recent months, I’ve heard murmurings that the major shale regions are running out of steam. On the other hand, no new major shale regions have been discovered. If this is true, then we may be at the beginning of the permanent decline of shale oil productivity. If so, then we can expect U.S. oil production growth to decline even with rising prices, which would further pull oil prices up as there’s no other source of significant production growth anywhere else in the world. In this new era, the winners will be those oil producers that have already locked up good land, which they have yet to drill. I also anticipate that alternative transportation (electric, hybrid and fuel cell) will do well. I will continue to monitor the developments on oil well productivity closely. But I feel good about the stocks that I own in my TFSA, for now.